Lake McGinnis is across the road from this building site! 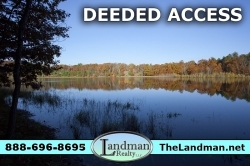 Bring your building plans and live your dream of living close to the lake! Simply beautiful, nicely wooded lot that is over 3/4 of an acre and is right across the road from McGinnis Lake! There is a clearing just waiting for your cabin or home. The land is possibly suitable for a walk-out basement. Relax at this 27 acre, no-motor lake that is up to 28' deep, where largemouth bass and panfish are common. This is located approximately 20 minutes from Wisconsin Dells where you can enjoy fine dining & unique entertainment and about the same distance from the interstate. Nice low price for this easily accessible and very affordable parcel. Call Listing Agent John Olson directly on his cell phone at 608-474-2110 for more information or to schedule a showing of this property. Or call the office toll-free 1-888-696-8695. I would like more information regarding the property 1820453, Across the road from Lake!